Unfortunately we didn’t receive any entries for our first Photo Caption Contest. We’ll try again soon with a different game camera picture, so keep checking back for your chance to enter and win. This past week has been a non-stop, no sleep, no regret whirlwind of outdoor adventures. I flew out of Milwaukee, WI into Miami, Florida and drove straight into everglade country for some serious Osceola turkey hunting. I arrived in Miami at midnight and met with my good friend, John Stamper of Student Outdoor Experience. SOE is an organization that focuses on educating middle school and high school students about the outdoors through strong leadership and promotes the heritage of our beloved sport from this generation to the next. We hit pavement as soon as I grabbed my camo duffle bag, which was probably the only camo colored bag in the entire airport! We had a 3-hour drive north through the middle of the night en route to turkey territory. My anticipation for the hunt left me nerved the entire drive. There was no possible way I could sleep or even feel drowsy. Once we arrived near our camp, we went to the nearest café and hammered down some appetizing breakfast. John laid out the game plan of the turkey hunt. He had told me that we’d be going to a friend’s chunk of property to hunt turkey. We arrived in camp at nearly 4:30 in the morning. As soon as John introduced me to the landowner it was time to put the camo on and get into the palmetto patches and cypress heads. We trekked our way through the marshy grasses, pine groves and into a green field as the morning light slowly progressed into light casts of blue. We edged our way down a fence line and found our setup. As soon as we sat down and got positioned, we heard a gobbler thundering throughout the humid Florida air. It was so amazing to me that not a day earlier I sat freezing in Wisconsin and now I was thawing off in temperatures I don’t usually see until July. The palmettos began accenting bright oranges and shades of red from the morning sunrise. I soon knew it was time to bust out the turkey calls and make some rhythmic music in the misty morning air. I broke the silence with a slight rasp and was surprisingly answered before I could finish my sequence. I began flirting with this gobbler the entire morning hoping I could entice him in making the walk from his roost to the end of my shotgun barrel. I soon spotted a parade of jakes marching toward me into the decoys. They stood perplexed, glaring at my jake and hen decoy combo. Before the jakes left, they attempted to shriek an immature gobble at a hen with seducing soft yelps from the other side of the field. This really shook-up the big gobbler I had been working all morning, he suddenly turned silent. Within minutes I spotted him strutting his way towards my decoys. Not once did he gobble, but ventured ahead with curiosity and pure adrenaline stemming from his bright red head. At 40-yards I raised my shotgun, put the bead over his neck and pulverized him. Everything happened instantly, I couldn’t quite grasp the situation. I went over 24-hours nonstop without sleep and was fortunate enough to work a very elusive bird within range. It made for a great experience and extraordinary adventure. Well, you have put in your time scouting and locating a gobbler. As you begin calling, a couple of toms respond and begin heading toward you, quickly closing the gap. As they approach and start strutting around, how do you identify which one is a mature gobbler? An easy way to determine a jake (juvenile gobbler) from a mature gobbler is to look at the tail. When the tail is fanned out on a jake, the middle feathers will be between 2 to 4 inches longer than the rest of the feathers. These longer feathers give the fan an uneven hump in the middle. The reason behind this is that in late summer as a jake molts he only replaces the middle tail feathers. The next year the tail molts in the normal adult pattern leaving gobblers with a nice even fan. Once gobblers reach 2 years of age they will have an even fan for the rest of their life. Next time you find yourself fortunate enough to be surrounded by a group of toms, remember this quick easy tip for gauging the age of a strutting turkey at a distance. I, along with so many of my friends and hunters I know, have a passion for turkey hunting. It started a long time ago and has only grown. When deer season ends, I begin wearing my wife out with non-stop practicing of my turkey calls. I even go outside right at dark and use my owl call to try to call up the barred owls that I can hear near my house. My neighbors probably wonder what all the noise is about. I was able to turkey hunt for the first time this year on a farm that I hunted during deer season. The owner told me it has birds on it. It is very near my home, so I decided I would spend opening day trying to get a gobbler into shotgun range. Prior to opening day, I spent about the same amount of time getting things together and making sure I didn’t forget anything just as I did before the opener of deer season. My family knows something is about to happen because I “go missing” in my basement for about four afternoons straight until I’m done. Among other things I have patterned my gun, washed my camo, prepared a special “TURKEY HUNTING TOTE” for all my turkey equipment, tried out a variety of new and old calls, and crammed everything I thought I might need into my vest. By the time I was through with that little chore the vest weighed about 10 pounds. All that I needed now was good weather on opening morning. Blowing wind makes turkeys shut down and become silent. As always before an opener, I couldn’t sleep. I kept tossing and turning, anticipating the alarm to go off. It’s a different sensation than waking up for work. I don’t know quite how to explain it but I’m sure every hunter reading this knows what I mean. By the time the clock did go off I was already wore out from lack of sleep. Man, I didn’t want to get up and I questioned my sanity once again. I reasoned with myself that the location was close and that I didn’t have a two-hour drive to dread going or coming back. I got myself together, ate breakfast and took off. After the “long” 10-minute ride, I arrived and loaded my golf cart; placed my vest in the bed and my shotgun on the gun rack. I made my way to the end of an old logging road. There, in the pink light of predawn. I followed the trail I had made during deer season to a high ridge. I wanted to be on the highest place possible to call and listen for a response. Along the way I could hear barred owls calling with the cadence of, “WHO COOKS FOR YOU, WHO COOKS FOR YOU ALL!” I really love all types of raptors, but owls are by far my favorite. Of them, the barred owl means the most because it’s such a part of turkey season each year. They are so vocal in the woods at this time of year. As I stood still and listened, one owl would call and then another that seemed so far away would answer. This went on for several minutes. Another one even closer chimed in and the whole woods woke up. I could hear the first birds, and in the chill of early morning I was thankful to be alive and have the opportunity just to be here witnessing it all. I looked up between the branches of the bare oak tree I was standing near and said a thoughtful prayer of thanks. Just then, I heard a faint gobble in the distance. I did a barred owl call and he gobbled again. It was as if he turned and faced me to gobble this time. I took off as fast as I could to close the distance between us stopping about every 75 yards or so to call again. Each time I did, he answered and I knew I was on the right track. The last time I called, it sounded like I was within 75 to 100 yards of him and he was still on the limb. I found a big oak tree wider than me that looked just right. I quickly sat out my jake and hen decoys 25 yards in front of me and went back to the tree to settle in. I put my mouth call in and pulled out my favorite slate call. I began doing a soft tree call. After a couple of series of these I did a fly down cackle with my mouth call while beating the side of my pants leg with my gloved hand to simulate a hen pitching off the limb and flying to the ground. The gobbler cut me off in the middle of the call with a double gobble. I then heard the distinct sound of him flying down. Using my mouth call and slate at the same time I started yelping and cutting to make the old bird think there was a flock of hens where I was. He gobbled again and again. I knew he was on the way. What I couldn’t have known though was that he and I were separated by a big creek that was about 15 yards wide and a good 60 yards away. I watched the tom through binoculars come right down to the creek, display his full fan and strut back and forth on the other side. From that distance he couldn’t see my decoys. All he could do was hear the hens that were on the other side. Long story short, after 20 minutes of being hung up on the other side of the creek and me being pinned down against the oak tree, the tom moved off and the game was over. I left the woods with a smile on my face anyway. Turkey 1, Coop 0. That’s why they call it turkey HUNTING. It’s okay though, we WILL meet again. He got a pass Easter Sunday because of a family get together, but next weekend I’ll be back to match wits with this old tom and once again it will be GAME ON! Moultrie receives hundreds of photos captured with Game Spy trail cameras every month. We thought it would be fun to take an interesting photo and let our blog readers create a caption. Make the caption funny, cute . . . whatever you choose. A judge from Moultrie will pick the best caption and the winner will receive a Moultrie Game Spy t-shirt. Put your thinking caps on, and good luck! To enter, click "comments" below and add your caption in the comments field. Please provide a valid e-mail address so we can inform the winner. Your e-mail address will not be viewable and Moultrie will not will not use, share or exchange your e-mail address. Check back on Friday - March 28th to find out which caption won. From preparing and planting food plots to hauling your harvest out of the woods, ATV’s have definitely made hunters' lives easier. For many small land owners and hunters it is hard to justify the expense and upkeep that comes along with owning a tractor. With a few implements and accessories an ATV can become a worthy alternative to tractors for hunters. Agricultural Sprayer - this is an important piece of equipment to have in your arsenal. Since most disks that are pulled by an ATV are light compared to the ones used by tractors, spraying becomes a vital step by killing the vegetation on the plots so that the disk can easily get into the soil. Disk - Don’t skimp on this piece of equipment. Lightweight disks bounce over the top of the ground and do not really get down into the soil to disk it up. Buy the heaviest one that your ATV is rated to pull. Spreader - it is a great time-saving tool for spreading fertilizer and seed. Harrow - this is needed to smooth out food plots and cover the seed after it is spread. Most four-wheel drive ATV’s with at least 300ccs are capable of handling most implements. It is a good idea to talk to your dealer to make sure your ATV is compatible with the implements that you are planning on using. ATV’s are great tools to have as a hunter. With the wide range of accessories that you can purchase for them there is no limit to what they can be used for. I’m in the process of installing mineral sites on the properties I hunt. To me, these sites are very important. The deer benefit from a nutrient standpoint. I benefit from being able to check tracks near the sites, as well as camera monitoring to let me know what’s in the area. I like to keep these sites active all year long as part of my management strategy. Mineral sites are focal points for deer. The law in Georgia says that you can’t hunt within sight of one of these mineral stations. The strategy I use is to hunt an active trail leading to the site instead of hunting over it, just like I would approach hunting a food plot. Deer use mineral sites all year and reap benefits. In early spring, does carrying fawns especially need nutrients. 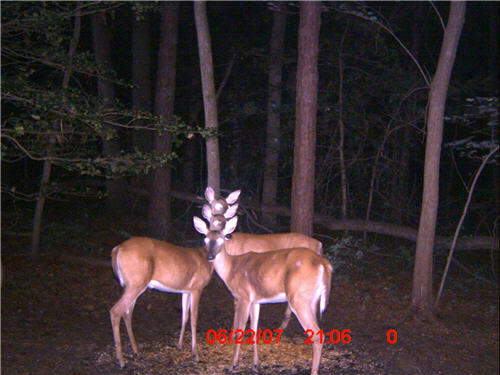 Bucks have used up their mineral reserves after rut and winter, which they need to develop new antlers. Later in spring, does that are lactating consume minerals heavily and by now bucks also need them to power the growth of antlers that are already coming on strong. In summer does and bucks continue to need minerals to sustain antler growth and aid does recovering from fawning and digestion of well established browse. In fall and winter, bucks and does are consuming a lot of calories preparing for colder temperatures and the rut to come. At this time, doe consumption of minerals at the site will increase and bucks will decrease. I’ve even seen bucks use a mineral site as a scrape. I reason that he realizes does frequent this place and he responds with a scrape. The main ingredients of many of the prepared minerals available today are calcium, phosphorus, sodium and magnesium. A lot of companies will also throw in a concoction of their own and patent it. Usually it will be something along the lines of molasses, sugar cane for an aromatic flavor that attracts deer, and protein and fat for calorie intake. Many companies make a powder form that can also be added to whole corn in a broadcast feeder or a gravity feeder to enhance the attraction. I have always had good success by simply preparing a site at the end of a food plot. The deer are already there feeding so it just makes sense to put the site there also. You can put it along a good trail and hunt the downwind side of the site of the trail as long as you’re not within sight of the mineral. To prepare my sites, I take a steel rake, clear the ground of debris and make a shallow, dish-shaped depression in the ground about 3-feet long by 2-feet wide. I usually pour a 40-lb. sack of a good mineral supplement evenly over the entire area. I make sure it’s in a trail so that deer can’t miss it. The reason for the depression is to collect water and wash the minerals into the ground. Farmers and wildlife managers I’ve talked to say that when deer eat the mineral-rich soil it aids in digestion. I’ve seen my sites grow 4 years later to 4-ft by 4-ft, 3-ft deep – you could use it as a foxhole! The whole idea behind mineral supplementation is a good practice and should be part of a sound management program on everyone’s hunting property. It enhances the overall health of the herd and that’s what we’re all after. Take a look online at the vast variety from so many companies today. They all have something different to offer. This is just one more step in the right direction toward having that little piece of heaven all your own to hunt healthy deer. Give it a try. This past weekend I drove to the suburban town of Rogers, MN, just outside of Minneapolis. As I drove past the sky-scraping towers and new housing developments sprawled across the entire city, my mind was elsewhere. I whizzed by cars, through city tunnels and over interstate bypasses with my car radio turned off yelping away on my diaphragm call! This was Rogers first annual Turkey Calling Competition, which was held at a nearby sporting goods store. I began practicing a few months prior to the competition - working on the high-tone raspy yelp, soothing purr, and the sporadic cackle turkeys seem to do with ease. Between my three mouth calls of choice; a double-reed ‘v’ cut, triple-reed ‘w’ cut and basic double-reed call, I sported a call for each sound that a turkey makes. Arriving at the sporting goods store, I busted out my calls and practiced calling as I walked down the aisles of spring hunting gear. After a brief walk-through of the store wishing I had each product on the shelf, I escalated my way up the stairs and to the stage area where the competition would take place. As I passed through the doors, I was shocked to see the amount of competitors registering. It’s always great to see more people getting involved in the sport. If you have never seen how a competition is run, it’s quite simple. A huge curtain blocks the vision of five judges that are anxiously awaiting your calling talent. A referee or spokesperson announces you by the number you draw, which details when you call and more importantly hides your identity so judges don’t have the slightest idea who you are. I entered the Intermediate division, which was for participants aged 16-20. I also competed in the Open division, for 21 and up. Nearly one-half hour before the competition began, the spokesman declared what turkey calls were to be mocked. The basic hens yelp, cutting of an excited hen, cluck purr, and kee-kee-run call were to be used in that order and sequence. The competition began and after a solid two hours of raspy hen yelps, screeching cackles and whistling kee-kee’s the event ended and it was judgment time! I was pleasantly surprised to hear my name called for 1st place in the Intermediate division and then was called right after to receive my 3rd place Open class award. We received a gift certificate from the sporting goods store and I used it within minutes to purchase some of the new spring gear. Turkey calling is a lively sport that anyone of any age can participate in. It is a great opportunity to have fun, talk turkey and, if you’re lucky, take home a trophy, plaque, gift cards and the fond memory of the experience. Moultrie’s line of sprayers makes prepping food plots simple. The sprayers easily mount on the back of your ATV or UTV, making it easy to reach remote areas. Turkey season opens in two weeks and I’m really getting antsy. I’m driving my co-workers crazy practicing my calling at work. I’ve looked through all the mail order catalogs for the new products that are guaranteed to put a bird in your lap or give you your money back. It’s always interesting to see what manufacturers will come up with next. One of my favorite parts of hunting is calling. I love using calls during deer season. They work. The difference in calling turkeys is that I can hear them respond. Once they sound off I can play the cat and mouse game that makes putting a move on a turkey so much fun. I know the property I hunt well so I can make an educated guess as to where a turkey is heading when he sounds off and starts going away from me. Many times it has allowed me to circle wide to get ahead of a gobbler in time to get set up and have another chance at him as he goes by me. It’s always a challenge and it’s always fun. The best calling and hunting tactics on earth won’t help you if you can’t hit what you’re aiming at. I try to practice each season with my shotgun. I try new loads and choke combinations to see which will pattern the best. These days there are so many chokes on the market it’s hard to know which one will suit you. I love a super tight pattern. The theory is that the more dense the pattern, the more pellets you’re going to put on the target at a given range. I try to let a turkey get inside 30 yards before I pull the trigger. I’m a perfectionist and am always looking for a choke that will allow me to put a few more pellets in the target. I’m looking at a choke right now that is about 1 ½ inches longer than most of the turkey chokes on the market today. This allows the pellets to gradually come to the final constriction before leaving the barrel instead of slamming them together all at once. This prevents deformed pellets and flyers resulting in a bad pattern. The choke is computer designed and the company says it has won many championships in the card shooting arena. I didn’t even know there was such a competition but there is. The shooters use slower than normal shells and super full chokes to deliver the tightest patterns at 20 yards on a card that is attached to a post. My personal best turkey gun was a Remington 1187 special purpose turkey gun with a 21-inch barrel. It had rifle sights on it and a choke made by the Tru-Choke machine company. It had a .650 constriction and shot a pattern so tight that at 20 yards it would make a very clean hole a little bigger than a ping pong ball in a patterning target where the head used to be. The only problem with a gun shooting a pattern that tight is that if the turkey’s head is moving a lot, you could miss him clean. I always aim at the red waddles that hang below his beak. This way, the pattern will still cover the area above and below the waddles and take out everything. To pattern my gun I begin by getting together the choke and shells I want to try. I clean my barrel before shooting and also clean it after every three shots. I just use a lightly dampened oil patch followed by a dry one. This keeps the bore clean and you get a more consistent pattern. I make plenty of copies of a patterning target and take along a staple gun. I use a piece of plywood and just staple the targets to it. I use a shooting bench that I made and a gun rest. I want to make sure I take the human element out of the picture when I’m patterning my gun. By using a gun rest I won’t have the tendency to flinch or pull the shot. I ALWAYS USE SHOOTING GLASSES AND HEARING PROTECTION. I start out with a new choke or new sights at 10 yards. I have a big piece of cardboard stapled to the plywood behind the target that allows me to see where the pattern printed. I may have to adjust my sights on the rib of the barrel to get the pattern centered on the target. Now that it’s centered I get to work trying the choke and load combinations. To keep from getting confused, I use a sharpie pen and mark every target after the shot as to the choke and the load used as well as the yardage. I give every combination two shots to make sure everything was the same. After the 10-yard shot, I back up to 20, 30, 40, and 50 yards. The reason for the longer shots is to see how well the pattern holds up at that range. The new HEVI-SHOT shells work extremely well at longer yardages because the pellets are made of a material that is heavier, harder and more uniform in shape than lead or even copper plated pellets. In short order I’m able to tell what pattern is the best and I stick with it throughout the season. My best pattern ever was 75 pellets in the neck and head of a patterning target at 40 yards! That pattern was tight. Unfortunately, the manufacturer that made that particular load went out of business. I haven’t found a load since then that will pattern as well. That’s my luck for you. Try this simple way of patterning your gun before the season starts and you will know exactly what to expect your gun to do before that old gobbler shows up. This way you won’t be scratching your head trying to figure out how in the world you missed that bird at 20 yards . . . STANDING STILL!! !